Design, Manufacturing, Consultancy, Media / Lectures and a Repair / restoration service (cloning of parts). 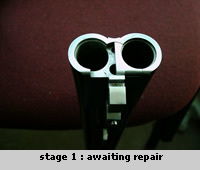 LSBS specialise in the repair and restoration of English firearms. The core business offers a full three dimensional design service followed by prototype component manufacture. This service utilises current ‘market leading’ software – Solidworks for computer aided design and Solidcam for computer aided manufacture. The 3D model can then be prototyped within L.S.B.S.’s secure manufacturing environment or any modern engineering manufacturing facility. LSBS Ltd has the unique skills, developed over the past 30 years (14 years in engineering and 16 years in gunmaking), to be able to talk gunmaking to the gunmakers and engineering to the engineers. These unique skills enable engineered parts to be manufactured to gunmaker’s requirements.